Kalamay, also spelled Calamay, is a sticky sweet delicacy that is popular in many regions of the Philippines. It is made of coconut milk,brown sugar, and ground glutinous rice. They can also be flavored with margarine, peanut butter, or vanilla. Kalamay can be eaten alone but is usually used as a sweetener for a number of Filipino desserts and beverages. 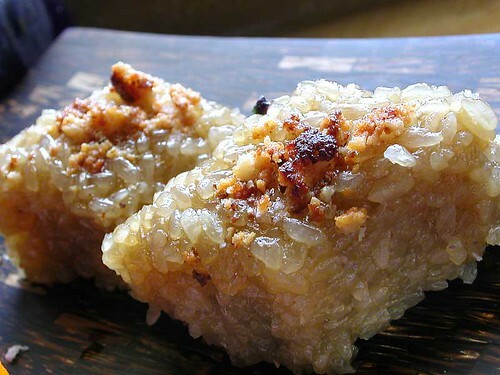 It is similar to the Chinese Nian Gao (also known as Tikoy in the Philippines) but is sweeter and more viscous. Kalamay is made by extracting coconut milk from grated coconuts twice. Glutinous rice is added to the first batch of coconut milk and the mixture is ground into a paste. Brown sugar is added to the second batch of coconut milk and boiled for several hours to make latík. The mixture of ground glutinous rice and coconut milk is then poured into the latík and stirred until the consistency becomes very thick. It can be served hot or at room temperature especially when eaten with other dishes. Viscous Kalamay are often served cooled to make it less runny and easier to eat. Kalamay is a popular pasalubong (the Filipino tradition of a homecoming gift). They are often eaten alone, directly from the packaging. Kalamay is also used in a variety of traditional Filipino dishes as a sweetener. This includes Suman and Bukayo. It can be added to beverages as well, like coffee, milk, or hot chocolate.